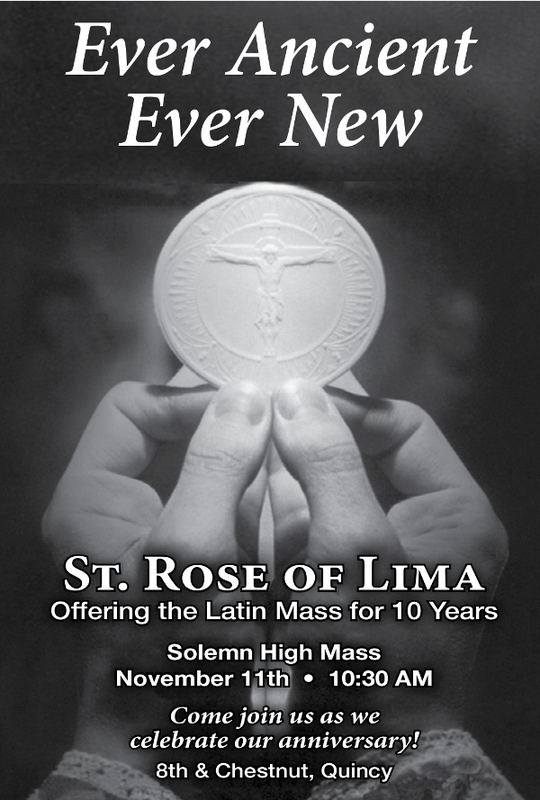 Low Mass at 8:00am; Solemn High Mass at 10:30am to celebrate the tenth anniversary of the reopening of St. Rose of Lima Church. All are welcome to join us in the hall for a meal after the 10:30 Mass. The proper used is the 23rd Sunday after Pentecost on page 862, except for the Collect, Epistle, Gospel, Secret, and Postcommunion, which are taken from the 5th Sunday after Epiphany on page 266. Preface of the Most Holy Trinity on page 884. Proper on pages 1586, 981. Common Preface on page 886. Proper on pages 1587, 217. Common Preface on page 886. Proper on pages 1589, 1032. Common Preface on page 886. Proper on pages 1590, 1057. Common Preface on page 886. Proper on pages 1591, 1023. Common Preface on page 886.